Girl Scouts - Paddle Safety, Brownie Try-it! From I-40 & I-25, head West on I-40 to Coors. Take Coors South. Go past Central and Old Coors. Turn left on Arenal. Go approximately 1 mile to the Rio Grande High School. The pool is easily identified by the multi-colored waterslide coming out of the building on the West side. The Paddle Safety class is a 1.5 hour program that emphasizes fun and safety....but really, it's all about fun and games! We show kids that "flipping over" is part of the fun, and so is "climbing" back in! 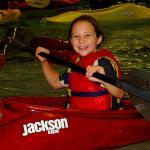 We teach them that a kayak is a fun toy, much like a beach ball, inner-tube or jungle-gym! We'll play games like "Tow the Swimmer," Marco-Polo, Sponge Bob Tag (think "hot potato"), and Duct Tape Tag. Along the way, your kids will become familiar with the kayak, how stable it is, how maneuverable it is, and learn that flipping over can happen accidentally, but can be a lot of fun if they practice the right technique. At the end of the class, most kids agree - flipping over is more fun than the games we play! The more fun your kids have playing in, on, under and around a kayak, the more excited they'll be about learning and going outdoors! This program is designed for kids age 5 - 9 years old. As instructors, our goal is to over-prepared kids for situations which have greater risk, such as the Rio Grande Bosque or Cochiti. Therefore, we recommend a minimum of 8hrs of pool time before we take kids outdoors. The repeated exposure allows kids to develop their skills, refine boat control, overcome fears of flipping, swimming to shore in cold water, or re-enter their boat from deep water. While going outdoors is the ultimate goal, we can form good habits by making "hard moves on easy water" where there is less risk. We also look for comprehension of important safety information from one class to the next; can they follow directions, without question or delay, choose and properly adjust their own PFD, and orient the paddle correctly; if they're constatnly holding the paddle backwards and upside down, we know that more time is needed before using a spray skirt or paddling on the Rio Grande. Troop leaders should register directly with Girl Scouts of New Mexico Trails, by contacting Katrina Garley at 505-343-1040. Questions regarding payment, refunds and GSNMT policies should be directed to Katrina Garley. Questions regarding the GSNMT Kayak Program, curriculum or skills development should be directed to New Mexico Kayak Instruction. Feel free to Contact Us!